In my previous post, I quoted Keynes’s remark about the “stimulus and useful suggestion” he had received from Hawtrey and the “fundamental sympathy and agreement” that he felt with Hawtrey even though he nearly always disagreed with Hawtrey in detail. One important instance of such simultaneous agreement about principle and disagreement about detail involves their conflicting views about whether it is the short-run rate of interest (bank rate) or the long-run rate of interest (bond rate) that is mainly responsible for the fluctuations in investment that characterize business cycles, the fluctuations that monetary policy should therefore attempt to control. started from common ground, not only on the need for policy, but in agreement that the instrument of policy was the rate of interest, or “terms of credit,” to be determined, directly or indirectly, by a Central Bank. But what rate of interest? It was Hawtrey’s doctrine that the terms of bank lending had a direct eSect on the activity of trade and industry; traders, having more to pay for credit, would seek to reduce their stocks, being therefore less willing to buy and more willing to sell. Keynes, from the start (or at least from the time of the Treatise 1930) rejected this in his opinion too simple view. He substituted for it (or began by substituting for it) an alternative mechanism through the long rate of interest. A change in the terms of bank lending affected the long rate of interest, the terms on which business could raise long-term capital; only in this roundabout way would a change in the terms of bank lending affect the activity of industry. There are, doubtless, persons, who, upon imperfect information, and upon insufficient grounds, or with too sanguine a view of contingencies in their favour, speculate improvidently; but their motive or inducement so to speculate is the opinion which, whether well or ill-founded, or whether upon their own view or upon the authority or example of other persons, they entertain the probability of an advance of price. It is not the mere facility of borrowing, or the difference between borrowing at 3 or at 6 percent that supplies the motive for purchasing, or even for selling. Few persons of the description here mentioned ever speculate but upon the confident expectation of an advance of price of at least 10 percent. In his review of the Treatise, published in The Art of Central Banking, Hawtrey took note of this passage and Keynes’s invocation of Tooke’s comment on Joseph Hume. Inasmuch as a higher than ordinary rate of interest supposes a contraction of credit, such goods as are held by means of a large proportion of borrowed capital may be forced for sale by a difficulty in obtaining banking accommodation, the measure of which difficulty is in the rate of discount and perhaps in the insufficiency of security. In this view, and in this view only, a rate of interest higher than ordinary may be said to have an influence in depressing prices. Tooke here concentrates on the effect of a high rate of interest in hastening sales. I should lay more emphasis on delaying purchases. But at any rate he clearly recognizes the susceptibility to credit conditions of the regular dealers in commodities. Granted, but could not very much the same be said of Keynes’s own alternative mechanism? One has a feeling that in the years when he was designing the General Theory he was still clinging to it, for it is deeply embedded in the structure of his theory; yet one suspects that before the book left his hands it was already beginning to pass out. It has left a deep mark on the teaching of Keynesian economics, but a much less deep mark upon its practical influence. In the fight that ensued after the publication of the General Theory, it was quite clearly a casualty. In other words, although Keynes in the Treatise believed that variation in the long-term interest rate could moderate business-cycle fluctuations by increasing or decreasing the amount of capital expenditure by business firms, Keynes in the General Theory was already advocating the direct control of spending through fiscal policy and minimizing the likely effectiveness of trying to control spending via the effect of monetary policy on the long-term interest rate. Hicks then goes on to observe that the most effective response to Keynes’s view that monetary policy operates by way of its effect on the long-term rate of interest came from none other than Hawtrey. It had taken him some time to mount his attack on Keynes’s “modus operandi of Bank Rate” but when it came it was formidable. The empirical data which Keynes had used to support his thesis were derived from a short period only-the 1920’s; and Hawtrey was able to show that it was only in the first half of that decade (when, in the immediate aftermath of the War, the long rate in England was for that time unusually volatile) that an effect of monetary policy on the long rate, sufficient to give substantial support yo Keynes’s case, was at all readily detectable. Hawtrey took a much longer period. In A Century of Bank Rate which, in spite of the narrowness of its subject, seems to me to be one of his best books, he ploughed through the whole of the British experience from 1844 to the date of writing; and of any effect of Bank Rate (or of any short rate) upon the long rate of interest, sufficient to carry the weight of Keynes’s argument, he found little trace. On the whole I think that we may infer that Bank Rate and measures of credit restriction taken together rarely, if ever, affected the price of Consols by more than two or three points; whereas a variation of }4 percent in the long-term rate of interest would correspond to about four points in the price of a 3 percent stock. Hicks concludes that, as regards the effect of the rate of interest on investment and aggregate spending, Keynes and Hawtrey cancelled each other out, thereby clearing the path for fiscal policy to take over as the key policy instrument for macroeconomic stabilization, a conclusion that Hawtrey never accepted. But Hicks adds an interesting and very modern-sounding (even 40 years on) twist to his argument. When I reviewed the General Theory, the explicit introduction of expectations was one of the things which I praised; but I have since come to feel that what Keynes gave with one hand, he took away with the other. Expectations do appear in the General Theory, but (in the main) they appear as data; as autonomous influences that come in from outside, not as elements that are moulded in the course of the process that is being analysed. . . . I would maintain that in this respect Hawtrey is distinctly superior. In his analysis of the “psychological effect” of Bank Rate — it is not just a vague indication, it is analysis — he identifies an element which ought to come into any monetary theory, whether the mechanism with which it is concerned is Hawtrey’s, or any other. . . . There is a term which was invented, and then spoiled, by Pigou . . . on which I am itching to get my hand; it is the term announcement effect. . . . I want to use the announcement effect of an act of policy to mean the change which takes place in people’s minds, the change in the prospect which they think to be before them, before there is any change which expresses itself in transactions of any kind. It is the same as what Hawtrey calls “psychological effect”; but that is a bad term, for it suggests something irrational, and this is entirely rational. Expectations of the future (entirely rational expectations) [note Hicks’s use of the term “rational expectations before Lucas or Sargent] are based upon the data that are available in the present. An act of policy (if it is what I have called a decisive action) is a significant addition to the data that are available; it should result, and should almost immediately result, in a shift in expectations. This is what I mean by an announcement effect. Just to conclude this rather long and perhaps rambling selection of quotes with a tangentially related observation, I will note that Hawtrey’s criticism of Keynes’s identification of the long-term interest rate as the key causal and policy variable for the analysis of business cycles applies with equal force to Austrian business-cycle theory, which, as far as I can tell, rarely, if ever, distinguishes between the effects of changes in short-term and long-term rates caused by monetary policy. The close, but not always cozy, relationship between Keynes and Hawtrey was summed up beautifully by Keynes in 1929 when, commenting on a paper by Hawtrey, “Money and Index Numbers,” presented to the Royal Statistical Society, Keynes began as follows. There are very few writers on monetary subjects from whom one receives more stimulus and useful suggestion . . . and I think there are few writers on these subjects with whom I personally feel more fundamental sympathy and agreement. The paradox is that in spite of that, I nearly always disagree in detail with what he says! Yet truly and sincerely he is one of the writers who seems to me to be most nearly on the right track! The tension between these two friendly rivals was dramatically displayed in April 1930, when Hawtrey gave testimony before the Macmillan Committee (The Committee on Finance and Industry) established after the stock-market crash in 1929 to investigate the causes of depressed economic conditions and chronically high unemployment in Britain. The Committee, chaired by Hugh Pattison Macmillan, included an impressive roster of prominent economists, financiers, civil servants, and politicians, but its dominant figure was undoubtedly Keynes, who was a relentless interrogator of witnesses and principal author of the Committee’s final report. Keynes’s position was that, having mistakenly rejoined the gold standard at the prewar parity in 1925, Britain had no alternative but to follow a policy of high interest rates to protect the dollar-sterling exchange rate that had been so imprudently adopted. Under those circumstances, reducing unemployment required a different kind of policy intervention from reducing the bank rate, which is what Hawtrey had been advocating continuously since 1925. In chapter 5 of his outstanding doctoral dissertation on Hawtrey’s career at the Treasury, which for me has been a gold mine (no pun intended) of information, Alan Gaukroger discusses the work of the Macmillan Committee, focusing particularly on Hawtrey’s testimony in April 1930 and the reaction to that testimony by the Committee. Especially interesting are the excerpts from Hawtrey’s responses to questions asked by the Committee, mostly by Keynes. Hawtrey’s argument was that despite the overvaluation of sterling, the Bank of England could have reduced British unemployment had it dared to cut the bank rate rather than raise it to 5% in 1925 before rejoining the gold standard and keeping it there, with only very brief reductions to 4 or 4.5% subsequently. Although reducing bank rate would likely have caused an outflow of gold, Hawtrey believed that the gold standard was not worth the game if it could only be sustained at the cost of the chronically high unemployment that was the necessary consequence of dear money. But more than that, Hawtrey believed that, because of London’s importance as the principal center for financing international trade, cutting interest rates in London would have led to a fall in interest rates in the rest of the world, thereby moderating the loss of gold and reducing the risk of being forced off the gold standard. It was on that point that Hawtrey faced the toughest questioning. HAWTREY. I do not think the credit of London depends on any particular figure of gold holding. . . . The harm began to be done in March and April of 1925 [when] the fall in American prices started. There was no reason why the Bank of England should have taken ny action at that time so far as the question of loss of gold is concerned. . . . I believed at the time and I still think that the right treatment would have been to restore the gold standard de facto before it was restored de jure. That is what all the other countries have done. . . . I would have suggested that we should have adopted the practice of always selling gold to a sufficient extent to prevent the exchange depreciating. There would have been no legal obligation to continue convertibility into gold . . . If that course had been adopted, the Bank of England would never have been anxious about the gold holding, they would have been able to see it ebb away to quite a considerable extent with perfect equanimity, and might have continued with a 4 percent Bank Rate. Somewhat later, Keynes began his questioning. KEYNES. When we returned to the gold standard we tried to restore equilibrium by trying to lower prices here, whereas we could have used our influence much more effectively by trying to raise prices elsewhere? KEYNES . . . I should like to take the argument a little further . . . . the reason the method adopted has not been successful, as I understand you, is partly . . . the intrinsic difficulty of . . . [reducing] wages? KEYNES. . . . and partly the fact that the effort to reduce [prices] causes a sympathetic movement abroad . . .? KEYNES. . . . you assume a low Bank Rate [here] would have raised prices elsewhere? KEYNES. But it would also, presumably, have raised [prices] here? HAWTREY. . . . what I have been saying . . . is aimed primarily at avoiding the fall in prices both here and abroad. . . .it is possible there might have been an actual rise in prices here . . .
KEYNES. One would have expected our Bank Rate to have more effect on our own price level than on the price level of the rest of the world? KEYNES. So, in that case . . . wouldn’t dear money have been more efficacious . . . in restoring equilibrium between home and foreign price . . .? HAWTREY. . . .the export of gold itself would have tended to produce equilibrium. It depends very much at what stage you suppose the process to be applied. KEYNES. . . . so cheap money here affects the outside world more than it affects us, but dear money here affects us more than it affects the outside world. HAWTREY. No. My suggestion is that through cheap money here, the export of gold encourages credit expansion elsewhere, but the loss of gold tends to have some restrictive effect on credit here. KEYNES. But this can only happen if the loss of gold causes a reversal of the cheap money policy? HAWTREY. No, I think that the export of gold has some effect consistent with cheap money. In his questioning, Keynes focused on an apparent asymmetry in Hawtrey’s argument. Hawtrey had argued that allowing an efflux of gold would encourage credit expansion in the rest of the world, which would make it easier for British prices to adjust to a rising international price level rather than having to fall all the way to a stable or declining international price level. Keynes countered that, even if the rest of the world adjusted its policy to the easier British policy, it was not plausible to assume that the effect of British policy would be greater on the international price level than on the internal British price level. Thus, for British monetary policy to facilitate the adjustment of the internal British price level to the international price level, cheap money would tend to be self-defeating, inasmuch as cheap money would tend to raise British prices faster than it raised the international price level. Thus, according to Keynes, for monetary policy to close the gap between the elevated internal British price level and the international price level, a dear-money policy was necessary, because dear money would reduce British internal prices faster than it reduced international prices. Hawtrey’s response was that the export of gold would induce a policy change by other central banks. What Keynes called a dear-money policy was the status quo policy in which the Bank of England was aiming to maintain its current gold reserve. Under Hawtrey’s implicit central-bank reaction function, dear money (i.e., holding Bank of England gold reserves constant) would induce no reaction by other central banks. However, an easy-money policy (i.e., exporting Bank of England gold reserves) would induce a “sympathetic” easing of policy by other central banks. Thus, the asymmetry in Hawtrey’s argument was not really an asymmetry, because, in the context of the exchange between Keynes and Hawtrey, dear money meant keeping Bank of England gold reserves constant, while easy money meant allowing the export of gold. Thus, only easy money would induce a sympathetic response from other central banks. Unfortunately, Hawtrey’s response did not explain that the asymmetry identified by Keynes was a property not of Hawtrey’s central-bank reaction function, but of Keynes’s implicit definitions of cheap and dear money. Instead, Hawtrey offered a cryptic response about “the loss of gold tend[ing] to have some restrictive effect on credit” in Britain. The larger point is that, regardless of the validity of Hawtrey’s central-bank reaction function as a representation of the role of the Bank of England in the international monetary system under the interwar gold standard, Hawtrey’s model of how the gold standard operated was not called into question by this exchange. It is not clear from the exchange whether Keynes was actually trying to challenge Hawtrey on his model of the international monetary system or was just trying to cast doubt on Hawtrey’s position that monetary policy was, on its own, a powerful enough instrument to have eliminated unemployment in Britain without adopting any other remedial policies, especially Keynes’s preferred policy of public works. As the theoretical source of the Treasury View that public works were incapable of increasing employment without monetary expansion, it is entirely possible that that was Keynes’s ultimate objective. However, with the passage of time, Keynes drifted farther and farther away from the monetary model that, in large measure, he shared with Hawtrey in the 1920s and the early 1930s. Before pausing for an interlude about the dueling reviews of Hayek and Hawtrey on each other’s works in the February 1932 issue of Economica, I had taken my discussion of the long personal and professional relationship between Hawtrey and Keynes through Hawtrey’s review of Keynes’s Treatise on Money. The review was originally written as a Treasury document for Hawtrey’s superiors at the Treasury (and eventually published in slightly revised form as chapter six of The Art of Central Banking), but Hawtrey sent it almost immediately to Keynes. Although Hawtrey subjected Keynes’s key analytical result in the Treatise — his fundamental equations, relating changes in the price level to the difference between savings and investment — to sharp criticism, Keynes responded to Hawtrey’s criticisms with (possibly uncharacteristic) good grace, writing back to Hawtrey: “it is very seldom indeed that an author can expect to get as a criticism anything so tremendously useful to himself,” adding that he was “working it out all over again.” What Keynes was working out all over again of course eventually evolved into his General Theory. Probably because Keynes had benefited so much from Hawtrey’s comments on and criticisms of the Treatise, which he received only shortly before delivering the final draft to the publisher, Keynes began sending Hawtrey early drafts of the General Theory instead of waiting, as he had when writing the Treatise, till the book was almost done. There was thus a protracted period of debate and argument between Keynes and Hawtrey over the General Theory, a process that clearly frustrated and annoyed Keynes, though he never actually terminated the discussion with Hawtrey. “Hawtrey,” Keynes wrote to his wife in 1933, “was very sweet to the last but quite mad. One can argue with him a long time on a perfectly sane and interesting basis and then, suddenly, one is in a madhouse.” On the accuracy of that characterization, I cannot comment, but clearly the two Cambridge Apostles were failing to communicate. The General Theory was published in February 1936, and hardly a month had passed before Hawtrey shared his thoughts about the General Theory with his Treasury colleagues. (Hawtrey subsequently published the review in his collection of essays Capital and Employment.) Hawtrey began by expressing his doubts about Keynes’s attempt to formulate an alternative theory of interest based on liquidity preference in place of the classical theory based on time preference and productivity. According to [Keynes], the rate of interest is to be regarded not as the reward of abstaining from consumption or of “waiting”, but as the reward of forgoing liquidity. By tying up their savings in investments people forgo liquidity, and the extent to which they are willing to do so will depend on the rate of interest. Anyone’s “liquidity preference” is a function relating the amount of his resources which he will wish ot retain in the form of money to different sets of circumstances, and among those circumstances will be the rate of interest. . . . The supply of money determines the rate of interest, and the rate of interest so determined governs the volume of capital outlay. As in his criticism of the fundamental equations of the Treatise, Hawtrey was again sharply critical of Keynes’s tendency to argue from definitions rather than from causal relationships. But despite the verbal difference between them, Keynes and Hawtrey held a common view that the rate of interest might be too high to allow full employment. Keynes argued that liquidity preference could prevent monetary policy from reducing the rate of interest to a level at which there would be enough private investment spending to generate full employment. Hawtrey held a similar view, except that, according to Hawtrey, the barrier to a sufficient reduction in the rate of interest to allow full employment was not liquidity preference, but a malfunctioning international monetary system under a gold-standard, or fixed-exchange rate, regime. For any country operating under a fixed-exchange-rate or balance-of-payments constraint, the interest rate has to be held at a level consistent with maintaining the gold-standard parity. But that interest rate depends on the interest rates that other countries are setting. Thus, a country may find itself in a situation in which the interest rate consistent with full employment is inconsistent with maintaining its gold-standard parity. Indeed all countries on a gold standard or a fixed exchange rate regime may have interest rates too high for full employment, but each one may feel that it can’t reduce its own interest rate without endangering its exchange-rate parity. Under the gold standard in the 1920s and 1930s, Hawtrey argued, interest rates were chronically too high to allow full employment, and no country was willing to risk unilaterally reducing its own interest rates, lest it provoke a balance-of-payments crisis. After the 1929 crash, even though interest rates came down, they came down too slowly to stimulate a recovery, because no country would cut interest rates as much and as fast as necessary out of fear doing so would trigger a currency crisis. From 1925, when Britain rejoined the gold standard, to 1931 when Britain left the gold standard, Hawtrey never stopped arguing for lower interest rates, because he was convinced that credit expansion was the only way to increase output and employment. The Bank of England would lose gold, but Hawtrey argued that the point of a gold reserve was to use it when it was necessary. By emitting gold, the Bank of England would encourage other countries to ease their monetary policies and follow England in reducing their interest rates. That, at any rate, is what Hawtrey hoped would happen. Perhaps he was wrong in that hope; we will never know. But even if he was, the outcome would certainly not have been any worse than what resulted from the policy that Hawtrey opposed. To the contemporary observer, the sense of déjà vu is palpable. In my previous post on Keynes and Hawtrey, I tried to show the close resemblance between their upbringing and education and early careers. It becomes apparent that Keynes’s brilliance, and perhaps also his more distinguished family connections, had already enabled Keynes to begin overshadowing Hawtrey, four years his senior, as Keynes was approaching his thirties, and by 1919, when Hawtrey was turning 40, Keynes, having achieved something close to superstardom with the publication of The Econoomic Consequences of the Peace, had clearly eclipsed Hawtrey as a public figure, though as a pure monetary theoretician Hawtrey still had a claim to be the more influential of the two. For most of the 1920s, their relative standing did not change greatly, Hawtrey writing prolifically for economics journals as well as several volumes on monetary theory and a general treatise on economics, but without making much of an impression on broader public opinion, while Keynes, who continued to write primarily for a non-professional, though elite, audience, had the much higher public profile. In the mid-1920s Keynes began writing his first systematic work on monetary theory and policy, the Treatise on Money. The extent to which Keynes communicated with Hawtrey about the Treatise in the five or six years during which he was working on it is unknown to me, but Keynes did send Hawtrey the proofs of the Treatise (totaling over 700 pages) in installments between April and July 1930. Hawtrey sent Keynes detailed comments, which Keynes later called “tremendously useful,” but, except for some minor points, Keynes could not incorporate most of the lengthy comments, criticisms or suggestions he received from Hawtrey before sending the final version of the Treatise to the publisher on September 14. Keynes did not mention Hawtrey in the preface to the Treatise, in which D. H. Robertson, R. F. Kahn, and H. D. Henderson were acknowledged for their assistance. Hawtrey would be mentioned along with Kahn, Joan Robinson, and Roy Harrod in the preface to the General Theory, but Hawtrey’s role in the preparation of the General Theory will be the subject of my next installment in this series. Hawtrey published his comments on the Treatise in his 1932 volume The Art of Central Banking. Not long after the Treatise was published, and almost immediately subjected to critical reviews by Robertson and Hayek, among others, Keynes made it known that he was dissatisfied with the argument of the Treatise, and began work on what would eventually evolve into the General Theory. Hawtrey’s discussion was especially notable for two criticisms. First Hawtrey explained that Keynes’s argument that an excess of investment over saving caused prices to rise was in fact a tautology entailed by Keynes’s definition of savings and investment. [T]he fundamental equations disclose . . . that the price level is composed of two terms, one of which is cost per unit and the other is the difference between price and cost per unit. Thus the difference between saving and investment is simply another name for the windfall gains or losses or for the difference between prices and costs of output. Throughout the Treatise Mr. Keynes adduces a divergence between saving and investment as the criterion of a departure from monetary equilibrium. But this criterion is nothing more or less than a divergence between prices and costs. Though the criterion ostensibly depends on two economic activities, “investment” and “saving,” it depends in reality not on them but on movements of the price level relative to costs. Hawtrey’s other important criticism was his observation that Keynes assumed that a monetary disequilibrium would manifest itself exclusively in price changes and not at all in changes in output and employment. In fact this criticism followed naturally from Hawtrey’s criticism of Keynes’s definitions of savings and investment, from which the fundamental equations were derived, as not being grounded in the decisions of consumers and entrepreneurs. With regard to savings, the individual consumers decide what they shall spend (or refrain from spending) on consumption. The balance of their earnings is “savings.” But the balance of their incomes (earnings plus windfall gains) is “investment.” Their decisions determine the amount of investment just as truly and in just the same way as they determine the amount of savings. Preferring the more natural definition of savings as unconsumed income and of investment as capital outlay, Hawtrey proceeded to suggest an alternative analysis of an increase in saving by consumers. In the alternative analysis both output and prices could vary. It was Hawtrey therefore who provided the impetus for a switch to output and employment, not just prices, as equilibrating variable to a monetary disequilibrium. It has been pointed out above that a difference between savings and investment [as defined by Keynes] cannot be regarded as the cause of a windfall loss or gain, for it is the windfall loss or gain. To find a causal sequence, we must turn to the decisions relating to consumption and capital outlay. When we do so, we find the windfall loss or gain to be one only among several consequences, and neither the earliest, nor necessarily the most important. To a large extent, Hawtrey’s criticisms of Keynes were criticisms of Keynes’s choice of definitions and the formal structure of his model rather than of the underlying theoretical intuition motivating Keynes’s theoretical apparatus. Hawtrey made this point in correcting Keynes’s misinterpretation of Hawtrey’s own position. In drawing attention to his belief “that an acceleration or retardation of the creation of credit acts through changes in consumers’ income and outlay . . . not through changes in the unspent margin,” Hawtrey emphasized that his monetary theory was not strictly speaking a quantity-theoretic monetary theory, as Keynes had erroneously suggested. Rather, he shared with Keynes the belief that there is a tendency for changes in expenditure and income to be cumulative. It was Hawtrey’s belief that the most reliable method by which such changes in income and expenditure could be realized was by way of changes in the short-term interest rate, which normally cause businesses and traders to alter their desired stocks of unfinished goods, working capital and inventories. Those changes, in turn, lead to increases in output and income and consumer outlay, which trigger further increases, and so on. In short, as early as 1913, Hawtrey had already sketched out in Good and Bad Trade the essential concept of a multiplier process initiated by changes in short-term interest rates, by way of their effect on desired stocks of working capital and inventories. Thus, it is a complete misunderstanding of Hawtrey to suggest that, in the words of Peter Clarke (The Keynesian Revolution in the Making pp. 242-43) that he was “the man who, having stumbled upon [the multiplier], painstakingly suppressed news of its discovery in his subsequent publications.” The multiplier analysis was not stumbled upon, nor was it suppressed. Rather, Hawtrey simply held that, under normal conditions, unless supported by credit expansion (i.e., a lower bank rate), increased government spending would be offset by reduced spending elsewhere producing no net increase in spending and therefore no multiplier effect. In fact, Hawtrey in 1931 in his Trade Depression and the Way Out (or perhaps only in the second 1933 edition of that book) conceded that under conditions of what he called a “credit deadlock” in which businesses could not be induced to borrow to increase spending, monetary policy would not be effective unless it was used to directly finance government spending. In Keynesian terminology, the situation was described as a liquidity trap, and we no refer to it as the zero lower bound. But the formal analysis of the multiplier was a staple of Hawtrey’s cycle theory from the very beginning. It was just kept in the background, not highlighted as in the Keynesian analysis. But it was perfectly natural for Hawtrey to have explained how Keynes could use it in his commentary on the Treatise. UPDATE (03/12/13): In reading the excellent doctoral thesis of Alan Gaukroger about Hawtrey’s career at the British Treasury (to view and download the thesis click here) to which I refer in my reply to Luis Arroyo’s comment, I realized that Hawtrey did not introduce the terms “consumers’ income” and “consumers’ outlay” in Good and Bad Trade as I asserted in the post. Those terms were only introduced six years later in Currency and Credit. I will have to reread the relevant passages more carefully to determine to what extent the introduction of the new terms in Currency and Credit represented an actual change in Hawtrey’s conceptual framework as opposed to the introduction of a new term for an a concept that he had previously worked out. For those interested in following me on a short excursion into philosophy and theology, click here. For the next few weeks, I am going to be writing a lot about the austere-looking gentleman whose visage adorns, and whose ideas inspire, this blog: the great, but underestimated, Ralph Hawtrey. I was asked last summer to write an entry on Ralph Hawtrey for the forthcoming Elgar Companion to Keynes, and, with the due date for my contribution fast approaching, I have decided to conscript readers of this blog as commentators and research assistants, as I try to pull together my scattered thoughts about the close, productive, and complicated relationship between these two luminaries of English economics in its heyday, during the first half of the last century. Obviously, more is known about the life of Keynes, by far the more famous of the two, than about Hawtrey’s, and my focus for this assignment is not so much Hawtrey in his own right, but Hawtrey as an important, but perhaps not quite central, figure in Keynes’s life, and in his career as an economist. But it is actually quite remarkable how similar were their backgrounds and how their lives and careers for a long time seemed to proceed on nearly parallel tracks. Both Keynes and Hawtrey were born into families in the upper echelons of the English intelligentsia and educational systems. Keynes’s father, John Neville Keynes, was a Cambridge don, who lectured on Moral Science and wrote a well-regarded book on the methodology of economics, The Scope and Method of Political Economy. Hawtrey’s grandfather was Assistant Master of the Lower School at Eton, and a second cousin of a Headmaster, and later Provost, of Eton. The grandfather subsequently established a preparatory school, St. Michael’s, where Hawtrey’s father became assistant master. Before going to Cambridge, Hawtrey and Keynes both attended Eton. Born in 1879, four years before Keynes, Hawtrey graduated from Cambridge in 1901, the year of Keynes’s arrival. Both studied mathematics, not economics, at Cambridge. While Keynes, through his father, knew Marshall well, it does not appear that Hawtrey had any contact with Marshall while at Cambridge or thereafter. In any event, both Hawtrey and Keynes were largely autodidacts in economics. Besides concentrating on mathematics, both Hawtrey and Keynes studied philosophy under G. E. Moore, and were greatly influenced by his teachings. Moore’s influence on Hawtrey is perhaps most clearly visible in Hawtrey’s 1925 book, The Economic Problem, his only book on general economics, a book that bears the stamp of Moore’s ethical teachings. Moore’s teachings were also a major influence on the Bloomsbury group of which Keynes was a famous member, and to which Hawtrey was also connected, though not as closely as Keynes. Like most male members of the Bloomsbury group, Hawtrey was a Cambridge Apostle, serving as Keynes’s sponsor when Keynes was elected an Apostle in 1903. Keynes’s 1925 marriage to the Russian ballerina Lydia Lopokova led to his estrangement from the Bloomsbury group. After Hawtrey married the Hungarian concert pianist Emilia d’Aranyi (a great-niece of the famed Hungarian violinist Joseph Joachim) in 1915 she was described by Virginia Woolf in a letter to Duncan Grant as “a practically barbaric Pole . . . with ungoverned passions and the brain of a yellow cockatoo,” though she noted the Hawtreys affectionate manner towards each other. Upon graduation, Hawtrey decided to enter the British civil service, and, in preparing for the entrance exam, began to study economics. Starting at the Admiralty in 1903, Hawtrey took a position in the Treasury in 1904 as a Clerk. Retaining his interest in mathematics, Hawtrey corresponded with his Cambridge friend Bertrand Russell about various proofs that Russell was puzzling over, proofs eventually published in the Principia Mathematica of Russell and Whitehead. In 1910 Hawtrey became the Principal Private Secretary of the Chancellor of the Exchequer, Lloyd George, assisting in the preparation of the 1910 Budget, and becoming a First Class Clerk in 1911. In 1919 he was appointed Director of Financial Enquiries Branch of the Treasury. While at the Treasury, Hawtrey undertook intensive studies into economics and the theory of money and business cycles, publishing his first book, Good and Bad Trade, in 1913, in which he presented a complete and purely monetary theory of the business cycle. Keynes also started in the civil service, becoming clerk in the India Office in 1906, but, growing bored with his work, he returned to Cambridge in 1908 to write his Treatise on Probability (not published till 1921). In 1909, Keynes became a lecturer in economics, and, in 1911, was appointed editor of the Economic Journal. In 1913, Keynes published first book Indian Currency and Finance, which led to his appointment to the Royal Commission on Indian Currency and Finance. After World War I started, Keynes rejoined the Civil Service and worked in the Treasury, but at a much higher level of responsibility than Hawtrey. And in 1919 Keynes was appointed the official representative of the Treasury to the Versailles Peace Conference, which led directly to the 1919 publication of Keynes first great work, The Economic Consequences of the Peace, his excoriation of the Treaty of Versailles,which established his reputation as an economist and made him a public figure of immense influence. During the war, Hawtrey worked in relative obscurity at the Treasury, publishing a few articles in the Economic Journal. But in 1919, Hawtrey, too, published his second book, Currency and Credit, which quickly became one of the most influential books on monetary economics in the world, becoming over the following decade the standard text in monetary economics in Great Britain and in much of the English-speaking world. As Director of the Financial Services Branch, Hawtrey could work more or less independently on whatever he wanted to while responding to the queries about monetary and financial policy put to him by higher-ups in the Treasury, or writing memos on whatever topics he thought his superiors needed to hear about. In this period, Hawtrey achieved his greatest influence on policy, writing several influential papers on the reconstruction of the international monetary system after World War I. He was instrumental in organizing the Genoa International Monetary Conference and writing its recommendations for restoring the international gold standard in the form of what became known as a gold exchange standard, an idea that Keynes had proposed in his Indian Currency and Finance. The goal was to stabilize the purchasing power of gold rather than allow it to rise prewar level, which would have entailed a massive deflation. In his Tract on Monetary Reform, published in 1923, Keynes mildly criticized Hawtrey and the Genoa resolutions for seeking to stabilize the international price level by way of the gold standard, which Keynes believed would put Britain at the mercy of the US and the newly created Federal Reserve System, which then held approximately 40% of the world’s monetary reserves of gold. Under those circumstances, Keynes felt it was better for Britain not to rejoin the gold standard, and certainly not at the prewar parity, but rather follow a policy aimed at stabilizing the internal British price level, while letting the dollar-sterling exchange rate take care of itself. This was the background for the more serious dispute between Keynes and Hawtrey in 1925 over the British decision to rejoin the gold standard at the prewar dollar parity of $4.86 per pound. While Keynes was totally opposed to restoring the gold standard at the prewar dollar-sterling parity, Hawtrey favored the move, because he was confident that the Federal Reserve would follow an accommodative policy allowing Britain to avoid significant deflationary pressure even with the pound back at prewar parity. The performance of the British economy after Britain returned to the gold standard was probably not as good as Hawtrey had hoped, but neither was it as bad as Keynes had feared. Unemployment, though high by historical standards, gradually declined to less than 10% by 1929, and British output and income growth was quite respectable. However, in 1928-29 when the Fed drastically tightened its policy in response to supposedly excessive stock-market speculation, Keynes’s fears that Britain would be vulnerable to the effects of policies taken by the Federal Reserve proved only too accurate. Of course, Hawtrey was sharply critical of the Fed tightening, especially given the insane policy of the Bank of France, starting in 1928, to convert its foreign exchange reserves into gold. Precisely the danger about which Hawtrey had been warning since 1919 was coming to pass, the combined result of the policies of the Bank of France and the Federal Reserve. Despite their disagreements about a number of details about how to implement policy, it does not seem that Keynes and Hawtrey had any fundamental disagreements about monetary theory or about the big picture of what was happening at the outset of the Great Depression. In the next installment, I’ll have something to say about the Keynes-Hawtrey relationship as it evolved while Keynes was writing the Treatise on Money and later the General Theory; Hawtrey was deeply involved in the process of writing and revising both works, reading and commenting on early drafts of both works, though, especially in the latter case, not without causing severe strains in the relationship. And as an added treat, I may also have a bit to say in a future post about Hawtrey and Hayek. Get the null on your side is my motto (I admit it). You follow this. You suggest that your hypothesis is the hull hypothesis then abuse Neyman and Person by implying that we can draw interesting conclusions from failure to reject the null. Basically the sentence which includes the word “null” is the assertion that we should assume you are right and I am wrong until I offer solid proof. To be briefer, since we are working in social science, you are asking that I assume you are right. This is not an ideal approach to debate. I ask you to review your sentence which contains the word “null” and reconsider if you really believe it. The choice of the null should be harmless (it is an a priori choice without a prior). How about we make the usual null hypothesis that an effect is zero. Can you reject the null that monetary policy since 2009 has had no effect ? At what confidence level is the null rejected ? Did you use a t-test ? an f-test ? “null” is a technical term and I ask again if you would be willing to retract the sentence including the word “null”. First, I was careless in identifying my hypothesis that monetary policy is an important factor with the “null” hypothesis. The convention in statistical testing is to identify the null hypothesis as alternative to the hypothesis being tested. What I meant to say was that even if the evidence is not sufficient to reject the null hypothesis that monetary policy is ineffective, there may still be good reason not to reject the alternative or maintained hypothesis that monetary policy is effective. In the real world, there is ambiguity. Evidence is not necessarily conclusive, so we accept for the most part that there really are alternative ways of looking at the world and that, as a practical matter, we don’t have sufficient evidence to reject conclusively either the null or the maintained hypothesis. With the relatively small numbers of observations that we are working with, statistical tests aren’t powerful enough to reject the null with a high level of confidence, so I have trouble accepting the standard statistical model of hypothesis testing in this context. But even aside from the paucity of observations, there is a deeper problem which is that, as Karl Popper the arch-falsificationist was among the first to point out, observations are not independent of the underlying theory. We use the theory to interpret what we are observing. Think of Galileo, he was confronted with people telling him that the theory that the earth is travelling around a stationary sun is obviously refuted by the clear evidence that the earth is stationary and that it is the sun that is moving in the sky. Galileo therefore had to write a whole book in which he explained, using the Copernican theory, how to interpret the apparent evidence that the earth is stationary and the sun is moving. By doing so, Galileo didn’t prove that the earth-centric model was wrong, he simply was able to show that what his opponents regarded as conclusive empirical validation of their theory was not conclusive, inasmuch as the Copernican theory was able to interpret the supposedly contradictory evidence in a manner that is consistent with the premises of the Copernican theory. As Kuhn showed in the Structure of Scientific Revolutions, the initial astronomical evidence was more supportive of the Ptolomaic hypothesis than of the Copernican hypothesis. It was only because the Copernicans didn’t give up prematurely that they eventually gathered sufficient evidence to overwhelm the opposition. using expected inflation to identify monetary policy is only a valid statistical procedure if one is willing to assume that nothing else affects expected inflation. If you think that say OPEC ever had any influence on expected inflation, then you can’t use your identifying assumption. In particular TIPS breakevens can be fairly well fit (not predicted because not out of sample) using lagged data other than data on what the FOMC did. Again, I don’t think formal statistical modeling is the issue here, because the data are neither sufficient in quantity nor unambiguous in their interpretation. The data are what they are, and if we cannot parse out what has been caused by OPEC and what has been caused by the Fed, we have to accept the ambiguity and not pretend that it doesn’t exist just so to impose an identifying assumption. 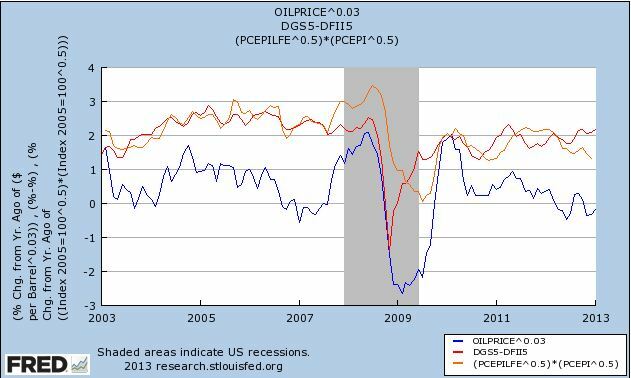 I would also make what I would have thought is an obvious observation that since 2007 the causality between the price of oil and the state of the economy has been going in both directions, and any statistical model that takes the price of oil as exogenous is incredible. I don’t see how anyone could look at this graph and then claim we can identify monetary policy by the TIPS breakeven. That is only valid if nothing but monetary policy affects inflation expectations. I don’t understand that. Why, if monetary policy accounts for 50% of the variation in inflation expectations is it not valid to use the TIPS spread to identify monetary policy? We may have to make some plausible assumptions about when there were supply-side disturbances or add some instrumental variables, but I don’t see why we would want to ignore monetary policy just because factors other than monetary policy may be affecting inflation expectations. Similarly in 1933 monetary policy wasn’t the only thing that changed. I understand that there was considerable policy reform in the so called “first hundred days. ” The idea that we can identify the effect of monetary policy by looking at the USA in 1933 is based on the assumption that Roosevelt did nothing else. This is not reasonable. Sure he did other things, but you can’t seriously mean that government spending increased in the first 100 days by an amount sufficient to account for the explosion in output from April to July. I would concede that other things that Roosevelt did may have also helped restore confidence, but I don’t see how you can deny that the devaluation of the dollar was at or near the top of the list of economic actions taken in the first 4 months of his Presidency. But I think we can detect the effect of recent monetary policy on TIPS breakevens if we agree that it (including QE) is working principally through forward guidance. There should be quick effects on asset prices when surprising shifts are announced. QE 4 (December 2012) was definitely a surprise. The TIPS spread barely moved (within the range of normal fluctuations). I think the question is settled. I do not think it is optimal to ignore daily data when you have it and treat same quarter as the same instant. Some prices are sticky and some aren’t. Bond prices aren’t. What makes you so sure that QE4 was a surprise. I think that there was considerable disappointment that there was no increase in the inflation target, just a willingness to accept some slight amount of overshooting (2.5%) before applying the brakes as long as unemployment remains over 6.5%. Ambiguity reins supreme.